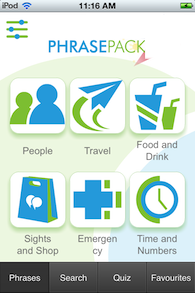 Phrasepack has been designed to help you interact with the locals. From ordering food in a restaurant, asking directions or to be in an emergency this app helps you to be understood by the locals in many situations. Phrasepack's specially designed sentence builder allows you to construct your own sentences without the need to look up for additional words. Have a look at our free Phrase books. Click on the flag of the language you like to use. If you have any issues or technical problems with our products, please do not hesitate to contact us at any time. It is important to us that you and others get the best out of our language learning software. Also, please share your feedback and ideas with us by filling out the form. Several customer suggestions have already made it into our products.